The past year has been a productive one for me professionally. I became an Associate Professor at Georgetown, completed my Master of Public Health degree, made national television and radio appearances to discuss lung cancer screening on NBC News and NPR, and was appointed to a four-year term as a member of the American Academy of Family Physicians' Commission on Health of the Public and Science. My most rewarding professional activity, however, continues to be writing for Common Sense Family Doctor. Below are links to and excerpts from the ten posts in 2013 that have received the most page views, with the top post viewed 6443 times to date. Even if people don’t follow the U.S. Preventive Services Task Force recommendations and discontinue prostate screening, I hope that we will have improved the quality of discussions patients are supposed to be having with their physicians about what their risk is, what outcomes they value, and what they are willing to endure to make sure that they don’t develop late stage prostate cancer. More than 90 percent of primary care clinicians aren't telling patients that there are downsides to undergoing routine mammograms, colonoscopies, and Pap smears. Why not? Is it because they aren't familiar enough with the data to accurately describe these harms? Or is it because they fear that patients who receive information about cancer screening harms will choose to decline these tests? With direct pay models, actual health care costs can be kept much lower and made much more affordable. Also, since direct pay models typically care for smaller patient panels, patients have more time with their primary care team to address the myriad of life issues that affect their health. Is it time to abandon routine calcium supplementation in healthy adults? If not, what additional evidence do we need? Will the Angelina Jolie effect turn out to be a spike in the rates of women being tested for the mutations in their BRCA genes? If so, it's likely that many more women will be harmed than helped. BRCA mutations are rare, affecting 2 to 3 per 1000 women. The vast majority of women who develop breast cancer do not carry these mutations and will not benefit from testing. For lower-risk patients, for whom the potential lifesaving benefits of CT scans are very small, the downsides of the screening test become considerably more important. Screening tests have harms just like any other medical procedure, and it's important for your doctor to thoroughly review those harms with you if you are considering screening. The Institute of Medicine has identified low levels of health literacy as a major obstacle to ensuring optimal health and quality of care. But how can physicians expect our patients to make informed decisions regarding screening tests when large numbers of us are functionally illiterate regarding basic screening concepts? Yes, robots and smartphones can and will play vital roles in the future of medicine. But if we really want sick patients to have the best chance to get better - and healthy patients to avoid getting sick in the first place - then we should do everything in our power to support low-tech and high-touch interventions too. Defining pregnancy as a disease to be prevented is not just a matter of semantics. An overly interventionist approach to pregnancy is largely responsible for the current U.S. rate of one in 3 babies being born by Cesarean section, and predictions that it may soon approach 50 percent. Where physician production is concerned, you get what you pay for. Medicare pays a disproportionate amount of its nearly $10 billion per year in subsidies to institutions that produce mostly subspecialists, at the expense of training sorely needed family physicians and other generalists whose presence has been shown time and again to deliver better health outcomes. Very best wishes for a happy and healthy 2014! Two types of "scut work"
When I was an acting Medicine intern in Manhattan's Bellevue Hospital at the turn of the century, all employees who provided the hospital's "ancillary services" went home between the hours of 5 PM and 8 AM. It was the job of the on-call interns to fill in. If a patient needed a stat blood draw or IV line replacement in the middle of the night, his nurse paged the intern to do it. If I wanted a vial of blood to reach the lab before the morning, the only way to accomplish this was to carry it there myself. If a patient needed an urgent x-ray or CT scan, I personally navigated his or her stretcher from room to elevator and through the corridors to Radiology. (Even during daytime hours, this was often the most efficient way to complete this task.) In those days when x-rays and scans were actually printed on sheets of transparent plastic and stored in file folders, it was also the intern's job to hunt down images needed for morning rounds. Generations of doctors-in-training have given the name "scut work" to these kinds of tedious, often disagreeable chores that do not require a doctor's degree but are nonetheless essential to patient care. More than a decade later, interns and residents continue to toil at similar unrewarding tasks in hospitals all over the U.S. and around the world. But scut has evolved in the era of electronic medical records to mean more than late-night blood draws and transporting patients and medical records. Scut work is now performed by physicians with decades of post-residency experience, at all hours, in outpatient and inpatient practice. It goes by important-sounding names: "Stage 2 Meaningful Use" or "NCQA Certified Patient Centered Medical Home." Specific tasks involve clicking through endless series of drop-down boxes to document smoking cessation counseling, order flu shots and age-appropriate cancer screenings, and record transitions of care and receipt of referral notes. These are all things that I would have documented in a free-text or dictated note, but must now jump through electronic hoops to get credit from private and public payers who believe that primary care patients will ultimately benefit from all this clicking even as it distracts my and my colleagues' attention away from the real work of doctoring. In clinics across the country we have observed patients send signals of depression, disagreement, and lack of understanding and have witnessed kind, compassionate, and well-intended physicians missing these signals while they multitask. These physicians are concentrating not only on the patient but on typing the history, checking boxes, performing order entry, and other electronic tasks. ... Computerized order entry displaces to the physician clerical tasks once performed by others, increasing time commitment and cognitive interruptions. The authors suggest that supporting team-based care models that rely on non-physicians to do the bulk of documentation may still save the physician-patient interaction. But this is unlikely to happen if physicians are required by federal regulators to type in orders themselves, or if new payment schemes do not rapidly supplant fee-for-service and render current billing templates obsolete. In contrast, Dr. Diane Chang describes old-school scut work in JAMA's "A Piece of My Mind" as "the physical, backbreaking, day-to-day work of taking care of another person." She shares scenes of doctors, nurses, aides, and other health workers debriding infected ulcers, cleaning up vomit and feces, feeding and bathing and changing beds. "Acts of caring are sacred: feeding the sick and old, cleaning them, and tending to their wounds are in some ways as intimate as you can get with another body," she writes. "In performing these acts, we bear witness to people naked and infirm, at the beginning of life or at the very end, or at the most vulnerable moments in their lives." I don't want to go back to my days of doing scut at Bellevue. I am not nostalgic about trying repeatedly to place an 18-gauge IV in a patient with no palpable veins at four in the morning, or replacing a delirious patient's nasogastric tube for the fifth time in as many hours because he kept pulling it out. But at least that kind of scut, unlike the tedious tasks involved in electronic documentation, was work that was meaningful to patients. The recently published American College of Cardiology / American Heart Association cholesterol treatment guideline, which updates the National Heart, Lung, and Blood Institute's Adult Treatment Panel III recommendations that have guided clinicians for more than a decade, has generated controversy for several reasons: primary care groups did not participate in development of the guideline; several panelists had financial conflicts of interest; its cardiovascular risk calculator may substantially overestimate risk in certain populations; and the lowered risk threshold for prescribing medication, if adopted worldwide, could potentially result in more than a billion people taking statin drugs. This post first appeared on the AFP Community Blog. What can Rwanda teach the U.S. about primary care? As reviewed on this blog and in many other sources, the relative underinvestment of resources in primary care in the U.S. has a great deal to do with the fact that we spend far more on health services than anywhere else in the world but rank near the back of the pack in key health metrics such as life expectancy, infant mortality, and disability compared to other high-income countries. Although economic inequality, lack of insurance coverage, and shrinking public health budgets are also part of the problem, I'd argue that diverting dollars from redundant multi-million dollar proton beam facilities to provide a patient-centered medical home for every American would have positive effects on population health. Even though I feel that the U.S. has a lot to learn from other countries about building infrastructure to support high-quality primary care, it was still hard for me to get my head around the premise of an Atlantic headline that caught my eye earlier this year: "Rwanda's Historic Health Recovery: What the U.S. Might Learn." Like most Americans who have never traveled there, I suspect, my impressions of Rwanda have been strongly influenced by popular dramatizations of the 1994 genocide such as the movie "Hotel Rwanda" and Immaculee Ilibagiza's memoir Left to Tell. I had a difficult time imagining how any semblance of a functioning health system could have emerged even two decades later, much less a system that would have something to teach the U.S. But a recent BMJ article by Paul Farmer and colleagues documented impressive gains in Rwandan life expectancy, led by declines in morbidity and mortality from tuberculosis, HIV, and malaria that resulted not only from investments in lifesaving drugs but in preventive and primary care. 93% of Rwandan girls have received the complete HPV vaccine series to prevent cervical cancer, compared to only 33% of eligible U.S. girls in 2012. Each district is served by a network of community health workers (CHWs) — three per village — offering health education, basic preventive and curative services, and family planning. CHWs are supported by local health centers, which serve approximately 20,000 people and are staffed by nurses, most of whom have a secondary school education level. Health centers provide vaccinations, reproductive and child health services, acute care, and diagnosis and treatment of HIV, tuberculosis, and malaria. District hospitals, staffed in part by 10-15 generalist physicians, provide more advanced care, including basic surgical services, such as cesarean sections. Image courtesy of BMC Health Services Research. At the top, you have the super sub-specialists, who are experts on a single narrow spectrum of diseases confined to one organ system (e.g., hepatologists). Lower down are the ordinary specialists, such as gastroenterologists, cardiologists, and pulmonologists, whose expertise is limited to a single organ system and age group (e.g., adults). Still lower are generalists whose scope of practice is limited by age group. 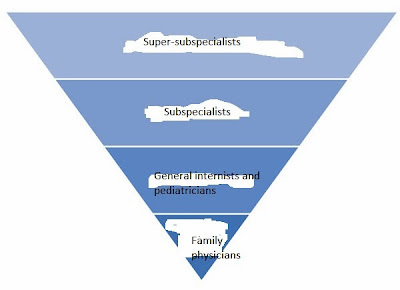 Finally, at the bottom, are the family physicians, the only type of physician whose scope is not limited by age, gender, or organ system. The problem with this upside-down pyramid is that it's inherently unstable. In Washington, DC, it's sometimes easier for a patient with musculoskeletal low back pain to get an appointment with a spine surgeon or for a patient with panic attacks see a cardiologist than it is to find a family physician. You can get a same-day MRI for any number of problems that probably don't require any imaging at all. Such a health system is inefficient and wasteful at best, harmful at worst, and destined to get the extremely poor results it does. 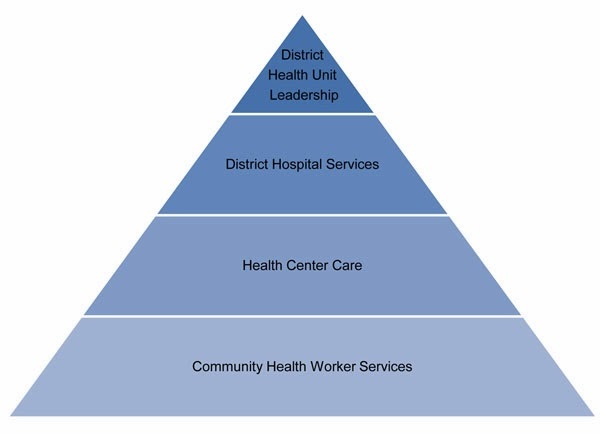 To improve population health in the U.S., we need to flip the pyramid so that primary care services are the base for all other health care structures. The possibility of 1 day in jail guarantees legal representation. The possibility of death does not.